Trove is a search engine focusing on Australia and Australians. It is managed by the National Library of Australia. In this session you will learn how to use it so you can find old newspaper and magazine articles and more, dating back to the 19th century. Start exploring! 2015 is the 100th anniversary of ANZAC. To commemorate this important milestone, The City of Tea Tree Gully Library is planning a special community event. 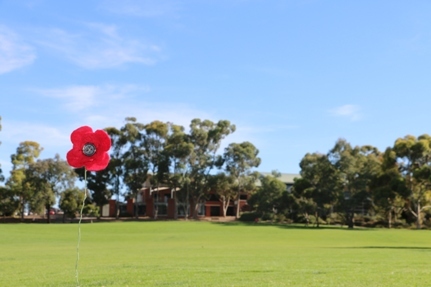 A Field of Remembrance will be established on Friday 1 May 2015 in Civic Park in Modbury, where thousands of handcrafted red poppies will be laid. Each flower will bear the name of a man or woman who served in the First World War. You can contribute to this moving event by nominating a serviceman or woman from any nation that participated in World War 1. Register online at http://www.cttg.sa.gov.au/poppyfield or complete a nomination card at the City of Tea Tree Gully Library. The nominated serviceperson can be a man or woman and can be drawn from any nation that took part in the World War I. This event will be held in partnership with the Tea Tree Gully District Historical Society and in consultation with Tea Tree Gully RSL. Local History Services Officer David Brooks is available to answer any questions regarding the history of Australian service personnel and is available to talk to schools and community groups about the Field of Remembrance project in more detail. Here’s the original poem from WWI soldier, from which the poppy legacy began. Do you need help with starting your family history or just want some practical advice on how to overcome problems with your research? Need to find the missing names, dates and relationships in your family tree? Experienced volunteers are available in Tea Tree Gully Library’s Local History Room to assist you with your family history research every Tuesday, Wednesday and Thursday from 11am-5pm. Should you have a large family tree to uncover, or you require assistance to perform a more detailed family history search, you can book a special one-on-one session with a volunteer on Wednesdays and Thursdays. Indexes of births, deaths and marriages. You’ll find indexes but full certificates are held by the registry office in the State that the event happened. Look for indexes and lists of passengers immigrating to Australia. Find records about sentencing, transportation, where convicts served out their sentences and maybe more. See where you ancestors were living. Come into the Library any time to make an appointment or give us a call on 8397 7333. Have you ever thought about starting your family tree? Interested in where you came from but not sure where to start? Come along to our Family History Course for Beginners. This course will be run every Saturday morning for four weeks by our Local History team. Over the four sessions you will be taught how to find information about your family, and how to record the information you find. There are limited spaces available for this course, so book now! The Local History room had a visitor today who had come to us a few months ago to pursue her husband’s Hungarian family tree. She came back this afternoon to tell us about their trip to Hungary in search of long-lost relatives. Our customer arrived in the area the family were from and asked around at many places including the local town hall. They had a few difficulties with language barriers, but eventually got through to a staff member who spoke English and could understand what they were looking for. After being told that the staff member would take some time to gather as much information as possible, our customer and her husband went for a walk to pass the time. When they came back they were told that a cousin would be there very shortly to pick them up so they could stay with him! Our customer found this to be an amazing experience and said the cousin looked exactly like many others in her husband’s family. They stayed with these new-found family members and were sent off a few days later with food and many newly formed friendships. This is just one example of how exciting it can be to discover your family history. Come talk to our friendly staff and volunteers and start yours today! Have you ever thought about how everyday life might have been different 150 years ago? Here’s your chance to find out. The first History Bites talk for this year is coming up on Wednesday 23 March at 6:30pm. It will be held in the Community Learning Centre and is all about life in the Victorian era. Discover what your ancestors would have seen, done, worn or even eaten. No bookings are necessary, just come along! Have you ever thought about keeping a journal of your family history research? It’s different from a research log – instead of just names, dates and facts, a journal records your feelings and opinions on finding out about your ancestors. It can be a fun and helpful way to reflect on your work and uncover information you may have missed. Our final Lunch Time Bites session for the year will be on Wednesday 17 November from 1:00pm in the Community Learning Centre. If you’re interested in keeping a research journal and want to know where to start, come along and find out. Don’t forget to bring your lunch!